There are several types of thread. The project that you are working on will typically dictate the type of thread you will need. In most cases, you will need to use an all-purpose thread. 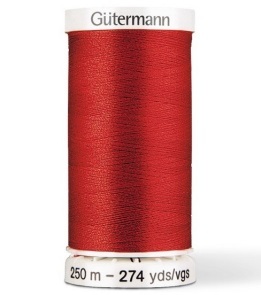 JOANN carries 3 major brands of thread – Coats & Clark, Gutermann, and Sulky®. Sulky® is used for machine embroidery. It's decorative thread is made from rayon and is not for basic sewing. 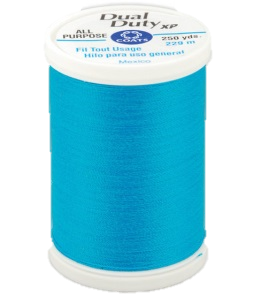 Coats & Clark and Gutermann both offer all-purpose sewing thread along with machine embroidery thread and several other specialty threads. • Change to a topstitching needle and larger needle size to accommodate the thicker thread. Elastic - thread with fine elastic within it. • Thread should match the fabric in most cases. If you can’t find an exact match, select a color one or two shades darker. 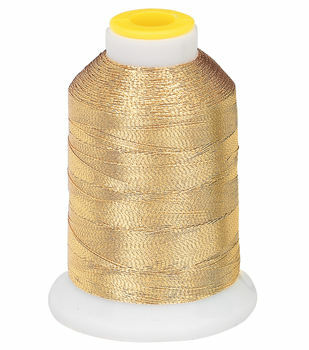 • When sewing a stretchy fabric such as a knit or spandex fabric, use polyester thread as it has some give to it. • Do not use hand-sewing thread in the machine; it is for hand-sewing only. • In most cases, the same thread should also be used in the bobbin. For machine embroidery, there is special bobbin thread that comes in black and white. When using top stitching thread, all-purpose thread is often used in the bobbin. But when sewing heavy duty items (canvas and upholstery) the heavier thread should be used for both the needle and the bobbin. Looking for More? Shop these products below.